Thursday morning at 2 a.m. (we think about food all the time! ), got an email same morning at 9:15 a.m. with shipping confirmation and tracking number–we had barely rolled in to work and the folks at Asian Food Grocer had already shipped our order! We got the perfectly packaged order at noon, Friday, less then 2 days from the our initial order. Now we could have driven down to Japanese town in LA to buy these ingredients, but given the traffic and time involved, this was so fast and convenient. We decided to make some staples of Japanese cuisine including dashi stock and from that make udon noodle soup. Nothing terribly exciting, but dashi is a fundamental part of Japanese cuisine and who doesn’t love udon? So with a bit of guidance from Maki at Just Hungry and Marc at No Recipes, both great sites on Japanese cuisine, we proceeded to make dashi stock and udon noodle soup with some items we had on hand, prawns and eggs. We didn’t know there there are two types of dashi stock–first stock, or ichiban dashi–which is the more flavorful stock use in clear soups such as udon and second stock, niban dashi, basically the second rendering to squeeze out every last bit of flavor of the ichiban dashi. 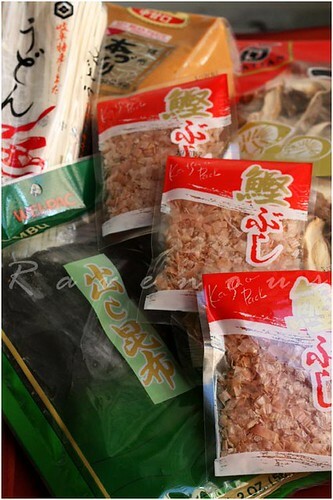 This is used to make stews or dishes where the flavor of dashi is not the main component. First soak the dried kombu and shiitake mushrooms in the cold water in the pot for about 20 minutes and then bring to boil. Remove the seaweed and shiitake and add 3 small packages or a heaping handful of the bonito flakes and turn off heat and allow it to steep for another 5-10 minutes or so. Strain with fine sieve, pressing out the stock from the bonito flakes. Save the shiitake mushrooms. The broth should be a clear light golden yellow color. Bring a pot of water to boil and quickly blanch the spinach and carrots and set aside. In same pot, add the udon noodles and cook until al dente. Cooking time varies depends on the thickness of noodles. When ready, strain in colander and shock with cold water to stop the cooking. Crack egg and place in small bowl or ramekin. Using a same pot filled 1/4-1/2 way with water, add about 1 tbs of white vinegar. Bring to rolling simmer (you’ll see bubbles floating from the bottom of the pot) and using spoon or whisk, give it a few good stirs. Gently lower the egg into the water and pour it out in the direction of the flowing water. The movement of the water helps to make the poach egg into a nice oval shape. It will begin to float when done, about 3-4 minutes. Carefully remove and shock in cold water bath and set aside. Or skip this step totally and just crack a raw egg in the soup. 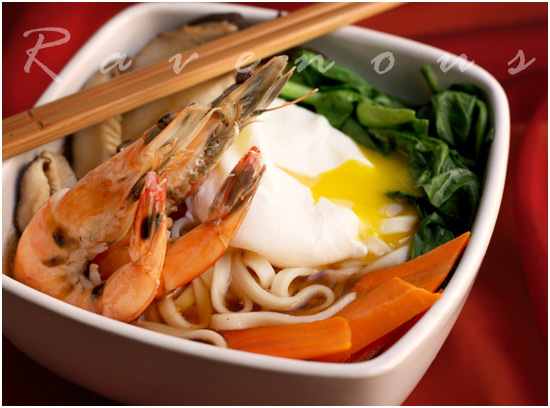 Prepare your noodles, mushrooms, spinach and carrots in a soup bowl. Heat the ichiban dashi and add the soy sauce, mirin, and sugar along with the prawns and bring to slow rolling boil. Make final adjustments with salt if needed and ladle broth over the noodle bowls. Top with prawns, poached eggs, and scallions and enjoy! Thanks Foodbuzz and Asian Food Grocer for this opportunity to learn about Japanese cuisine! 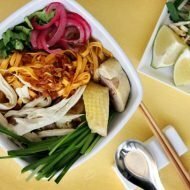 We should also add that there’s much more to to Asian Food Grocer aside from Japanese ingredients and include other Asian foods as well as household items, recipes, and more so check them out! Delicious. I love udon, especially when the weather starting to get cold. Factory Junkie: It's so simple but good! Elra: We're definitely going to make more soups and stews in the upcoming months! This is a bowl of yum. And that poached egg, with its golden yolk oozing … is … sublime!! Udon noodles sound so delicious! I was recently trying to figure out how to make dashi stock, will bookmark this for sure! I don't do much Japanese cooking either and I would definitely like to. It's just what you need when you've eaten too many days of heavy greasy foods. scly: making the tempura prawns is a great idea! Little Teochew: that's what made eating this dish more fun! 5 star foodie: Definitely check out Just Hungry and No Recipes. 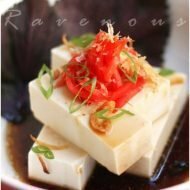 Both great sites on Japanese cuisine. 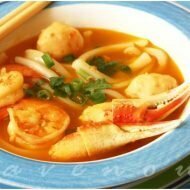 Jessica: Exactly..not too heavy..and not as complex as some of the vietnamese and chinese noodle soups, but simple and good flavors. This looks so fresh yet comforting. I love how you added the poached egg on top! wow your recipes are sooo delicious i think i will cook some of them later. The dashi stock sounds really simple to make. Looks amazing with the oozy yolk. I love my udon simple with just an egg and chili flakes. pigspigscorner: yes, it is simple and much better for you than the packaged powder dashi which is full of msg. What an awesome recipe, I love gooey centered eggs so this is right up my alley. The udon noodles look amazing. I also like to poach my egg for noodle soup. Yum! Maria: we love eggs with ramen and udon. 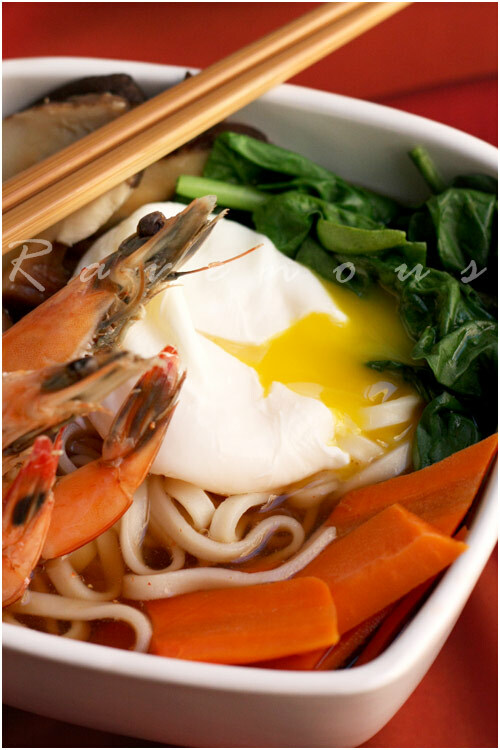 I love eating noodle soup…great photography with the runny poached egg, just perfect! I've streamed scrambled egg into the cooking brothwith package ramen (like egg drop soup) but never tried poached or raw (which I've heard is the most traditional way of serving egg over dashi noodles). Thanks for some new ideas and the help for this american in discovering traditional oriental foods. Here's to poached eggs in soups! Wow, thank you, lots of genuinely authentic japanese udon recipes here! I used to always have eggs in the udon that my late husband made it, but of all the recipes I've been finding on the internet not many mention eggs! How strange! that is not udon noodle. thats pasta.